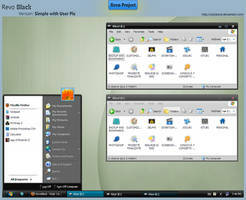 ~Aerilius has updated the theme to Ubuntu Light Themes 12.10. You most likely want to download it instead, because it has fixes for almost all the bugs and includes a Radiance color variant in addition to Ambiance. This port to Windows as well as the original Light themes for Linux are under a Creative Commons License, that means you can feel free to share, redistribute and (please) edit ! 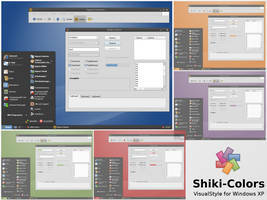 My intention was to bring the new polished look of Ubuntu and a more consistent visual appearance into my Windows programs in Virtual Box or Wine. As XP is still more widely used than Windows7 (especially in VirtualBox), I started with the Ambiance color scheme in XP msstyles format. Contributions of any kind are highly welcome! 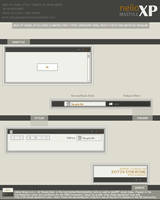 Unfortunately, many parts of XP styles cannot be skinned (context menu, rectangular text inputs, etc.). In addition most windows programs do not consistently use system colors/fonts, but override them with hard-coded colors/fonts (black) which can cause weird results. If you know how things could be improved, I would appreciate any help. i have windows 7 ._. Nice, but i got the real thing. But excellent job! I think this is a work of art. Congrats! I'm using this in Wine to make my Windows apps match my Ubuntu desktop. Thanks for your great work! My only suggestion is that if the context menus can't be cleaned up because of how the control/highlight/shadow colors work, it might be better to sacrifice authenticity for aesthetic and just use the lighter window color for the context menus. Well, as the author pointed out, there are some rough edges to be worked on, but other that that it's pure awesome! Many thanks for creating this appealing visual theme! It's a must for Ubuntu/WinXP dualboot junkees. Nice but the context menu needs improvement. Could you make a faenza icon pack and nav buttons too? if it is too much, then it's OK. I am using Natty though . I just want to transform my Big Sister's PC. thanks working..how to make font smaller like ori xp ? the ONLY thing that bugs me is, for instance, the start menu, which has an obnoxious white border. is there any way this can be changed? I' m working in a Ambience skin for Wb. Now I've all the resources! The download won't work! Can you try reposting it somewhere else please? Don't worry about it being dark, it looks perfect to me! For vista one day ? Beautiful theme thanks for sharing. I was looking for something like this for such a long time! Thank you! 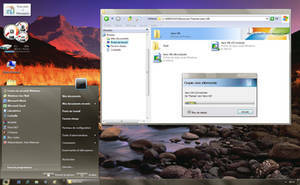 Now my virtualbox windows look the same as native ones! P.S. do you know the way to make these window button appear on the left? I love it. But I need this for Vista! Apologies for the ignorance, do I need to do something special to get this to work. Mine just looks like windows 2000 when I install it. Do I need a hacked theme.dll thingy? sorry I'm asking. I have windows xp and installed this theme but I want the Taskbar up there like in this picture not down like it's usually in Windows xp. I didnt read all the comments but if anyone knows how to do that I would apreciate an answer. Thank you. Right-click on the taskbar, and uncheck the box that has "lock the taskbar". 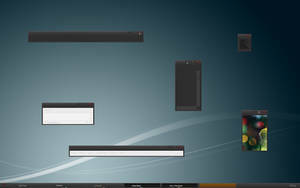 Then click and drag the taskbar (use an empty part of it, no icons/programs) and drag to the top. Any chances for a port to Windows 7? I'm using it on wine for ubuntu! and prograss not good !! Man, i just signed up into deviantART only to tell you, as an Ubuntu user, THANK YOU. It just makes wine applications (e.g. Reaper, as i use it to make music on both Win and Ubu) look way better than default. Obviously, as you say, there are still usability issues (sometimes buttons turn back to the default ugly theme when clicked, and Reaper menus disappear or aren't drawn correctly) so i switched back to the default theme, but i kept the color scheme. Anyway i think this is not your theme's fault, it's mostly wine's theming implementation, which is still buggy. And i believe you're focusing more on the WinXP theming part than on wine. Unfortunately, i have no knowledge in msstyles nor in how wine implements them, so i can't help you at the moment. 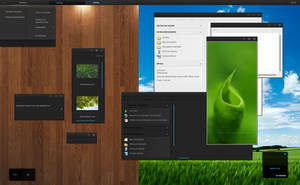 I hope this project will grow bigger and hopefully, one day, merge into ubuntu default wine package, as an option to make windows applications look native.